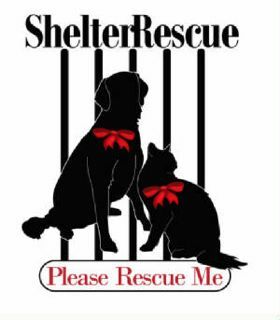 "Save a life.........adopt a shelter pet"
Please read the pet bios carefully. Information on where pets are located and adoption information will be given in the pet bios. This page currently contains pets listed at both Coweta County Animal Control facility. Please read the bios carefully for the listing of the shelter pet. 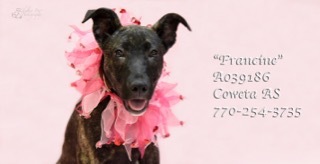 NEGATIVE COWETA COUNTY ANIMAL SERVICES TO ADOPT THIS PET: 770-254-3735. The address is 91 Selt Road, Newnan, GA. Introducing "Francine"! "Francine" is just a puppy (approx. 3 months old as of April 2019) and is just full of happiness and joy! She has so much love to give and will work her charms on you right away! 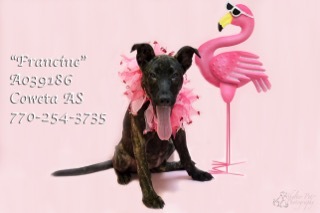 "Francine" would love nothing more than to be part of a loving family where she will be safe and cherished. Will you open your heart and home and give her a second chance at life and love? 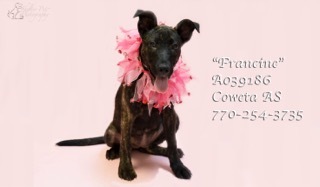 "Francine" was brought into the shelter as a stray from Meadow View St. area of Newnan / Coweta County in April and her family never reclaimed her. PLEASE HURRY! This pet has been at the shelter since 04/01/19.